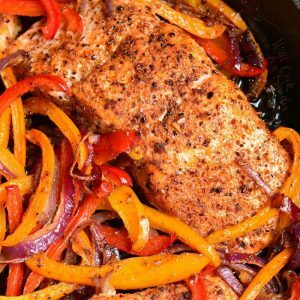 This baked salmon dish has only a few simple ingredients that come together in a fantastic Cajun Salmon dinner. 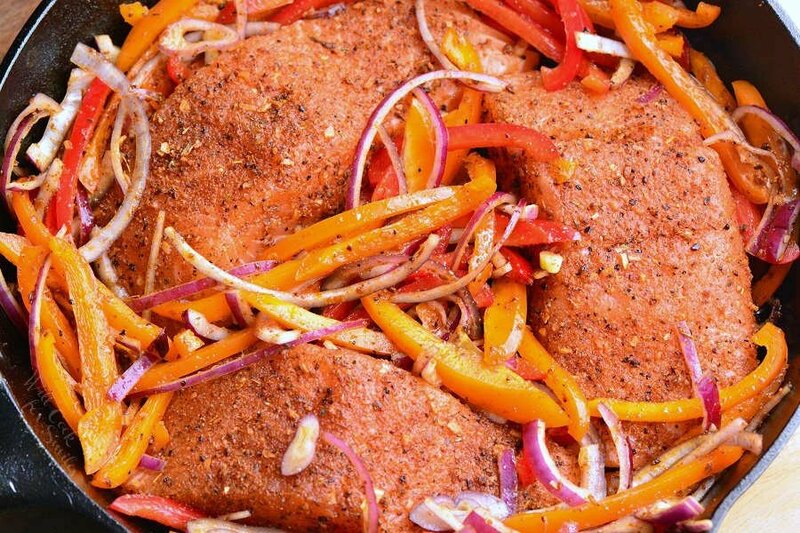 Juicy, fresh salmon is rubbed with Cajun seasoning and baked with bell peppers, garlic, and onions. 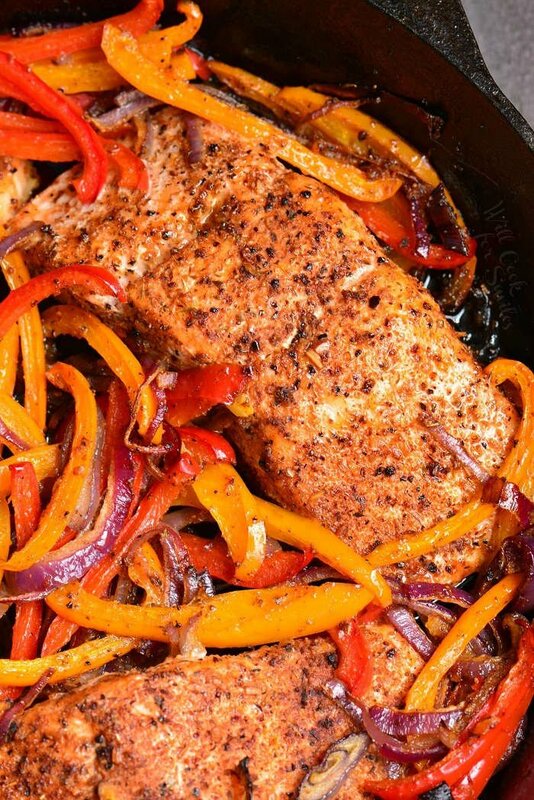 This easy salmon recipe can be served with roasted vegetables, over fluffy rice, or quinoa. Don’t leave before you try my one pan Baked Salmon and Asparagus dish and don’t miss a simple 4-Ingredient Orange Salmon. Learn how to make Crispy Skin Salmon as an alternative to baked salmon. Salmon is an amazing fish! This fish is used in a wide variety of dishes and stands to many preparation methods. Salmon can be cooked in the oven, on stove-top, on the grill, in an air-fryer, and smoked. Flesh of salmon is moderately dense, thick, and meaty, which helps is stand up to many different cooking methods and retain its shape and moisture. As long as salmon is not over-cooked, it is a very juicy fish. Luckily, because of the denser flesh, it’s not as easy to overcook it a delicate fish like flounder or trout. Salmon is probably the easiest fish to prepare because of it’s moderate firmness. Fish that is too delicate, like flounder, can easily fall apart and dry out while cooking. On the other hand, more firm fish like mahimahi, also has to be cooked with care because of it’s density. It is easier to overcook mahimahi than salmon because it is more dense and had less moisture. Salmon is quite forgiving and retains a lot of it’s moisture. For the best salmon texture, cook it no more than medium-well. Aside from being delicious and having the perfect texture, salmon is also full of health benefits. Salmon is packed with Omega-3 fatty acids, which are great for healthy brain function and development in babies, helps lowering blood pressure, lowers inflammation, helps with depression, and many other health benefits. Salmon is also high in protein, B Vitamins, and D Vitamin. All in all, salmon is a fantastic fish to include in your weekly menu. This is a very simple, minimum effort dish that tastes fantastic. All together, it will take you about 40 minutes to prepare, depending on thickness of salmon. 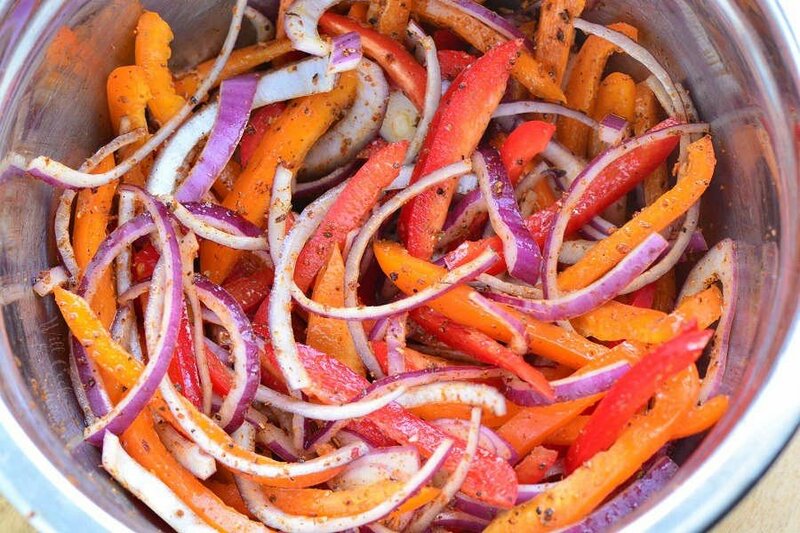 Slice peppers, onion, and garlic and mix it with Cajun seasoning and olive oil. Rub salmon pieces with olive oil and then Cajun seasoning all over. *Note: make sure your olive oil is good quality and has no bitterness to it or it will transfer into your dish. Olive oil can be substituted with canola oil if needed. Place salmon skin down in the skillet and spread veggies all around it. Bake for 20-25 minutes, depending on the thickness of salmon. You can check salmon by touch or use a meat thermometer. It is recommended by USDA to cook salmon to 145° internal temperature, which is when salmon is considered fully done. Personally, I prefer salmon at either medium or medium-well temperature, which is around 125°-130°. Even if you plan to make salmon where skin will not be crispy, taking off the skin would be a mistake. The main reason is because you will be taking off many health benefits. 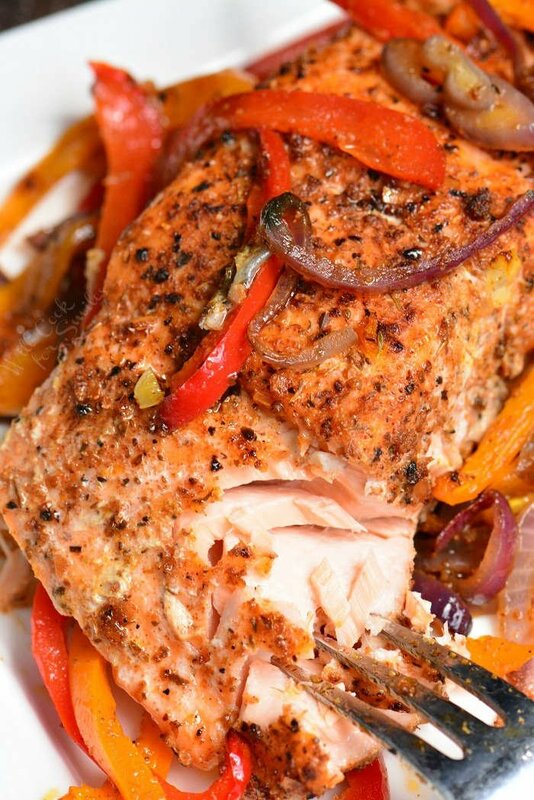 Skin also protects salmon fish from overcooking, helps retain moisture, and protects flesh from sticking to the pan. There is a fatty layer between salmon flesh and skin, which stores a lot of flavor, oil, and of course, many of salmon’s health benefits. While fish is cooking, fat melts into the meat and helps infuse the meat with flavor and keeps it moist. Depending on the recipe, I sometimes start by baking dish skin side up and then turn it over to finish cooking skin side down. I do that so that the fat melts into the meat. First, I do want to mention that leftover salmon doesn’t necessarily have to be reheated. I love using leftover cold salmon to create easy cold dishes. Try flaking some leftover salmon and topping avocado toast with it. Mix in leftover salmon into your salad for lunch or make salmon burger patties. My favorite way to use leftover salmon is to mix it with quinoa, few cold veggies, feta cheese, and Italian dressing. It makes a delicious and healthy quinoa salmon salad. If you really want to reheat leftover salmon and eat it hot, the best way is to do it in the oven. Reheat it at lower temperature and just until it’s heated through. Preheat oven to 275° and place salmon either on a rimmed baking sheet or oven-safe cooking pan. 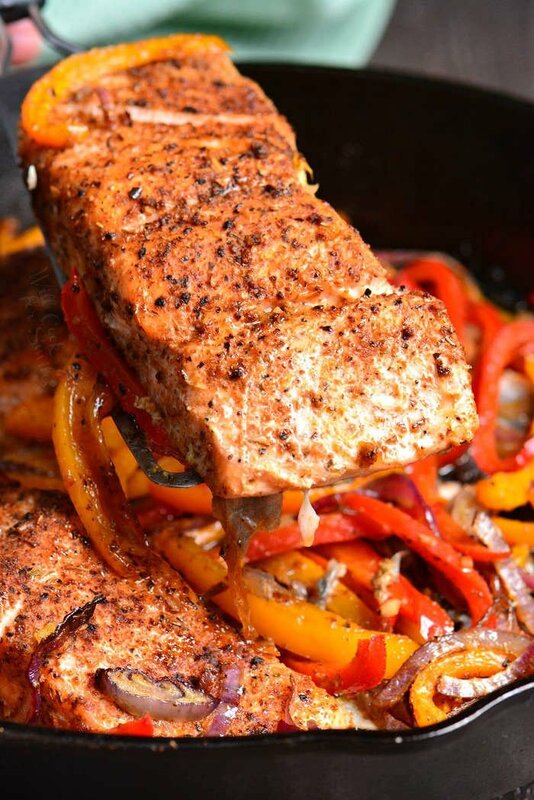 If you previously cooked salmon with some veggies, like this Cajun Salmon, place veggies under salmon. Veggies will help with salmon retaining moisture. Cover salmon loosely with aluminum foil to help keep moisture inside. If you didn’t cook salmon with veggies, don’t worry, just make sure to cover salmon with aluminum foil. Reheat it for 13-16 minutes, depending on the size of salmon pieces. 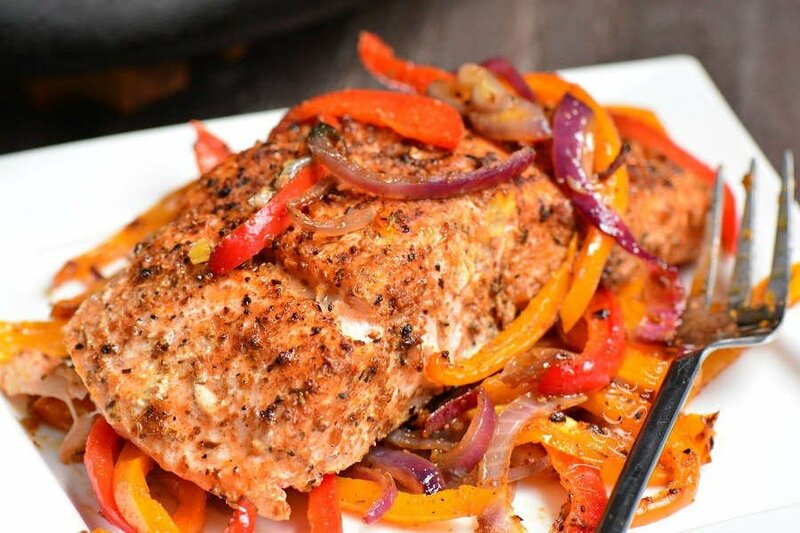 Juicy, fresh salmon is rubbed with Cajun seasoning and baked with bell peppers, garlic, and onions. Serve it with roasted vegetables, over fluffy rice, or quinoa. Slice peppers, onion, and garlic and mix it with Cajun seasoning and half of the olive oil. Rub salmon pieces with remaining olive oil and then Cajun seasoning all over. *Tip: taste your Cajun seasoning mix before using it to check if more salt is needed. If needed, add a little salt to salmon and veggies. 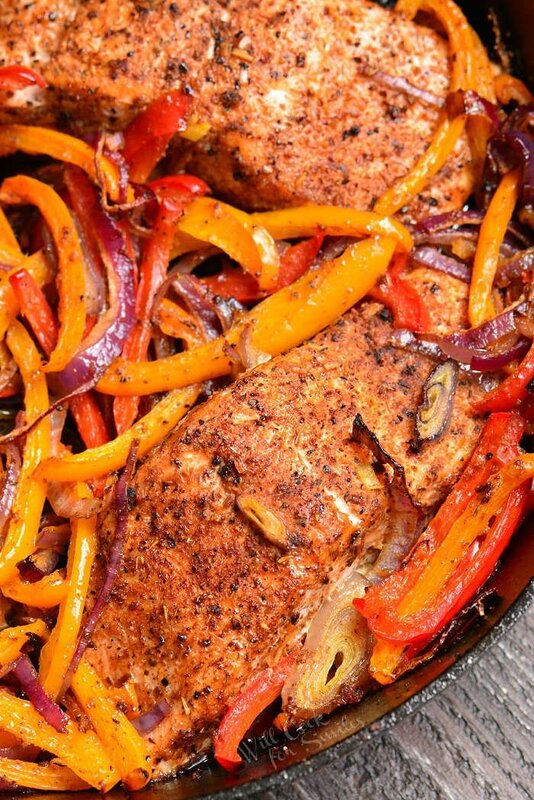 I just saw your Cajun Baked Salmon recipe & would like to try a variation, as I don’t like bell peppers. I love the idea of the cajun seasoning, onions, etc. Any thoughts about what other veggies might work? I’m so sorry for the late response! I think you could use zucchini and summer squash or green beans and asparagus. I bet that would be just as delicious. Hope that helps!